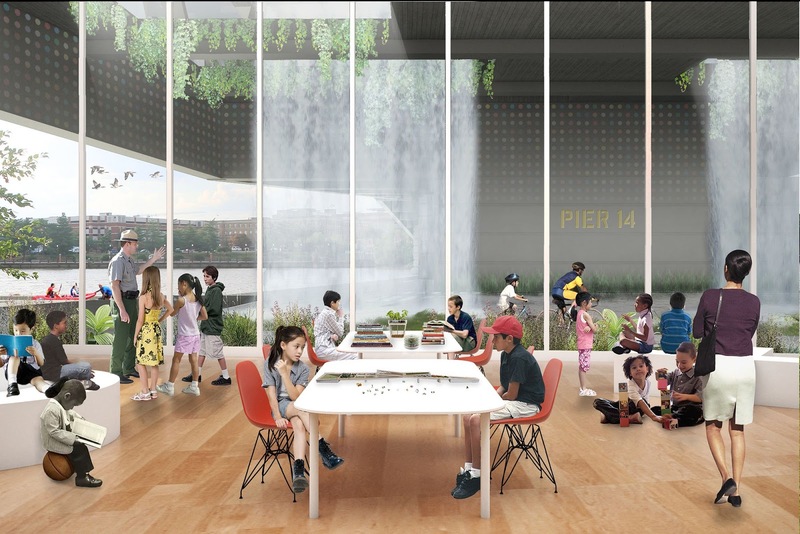 OMA and Olin Studio selected to design 11th Street Bridge Park. 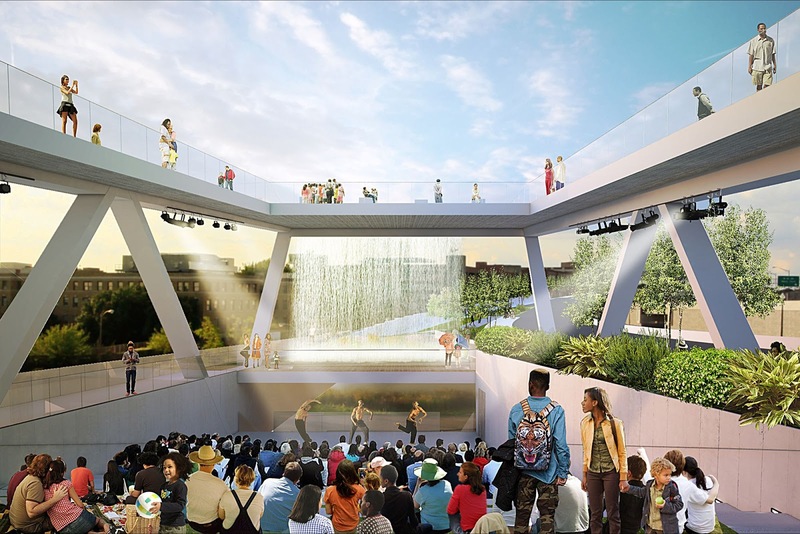 Our design for the 11th Street Bridge Park—the Anacostia Crossing—is a place of exchange. 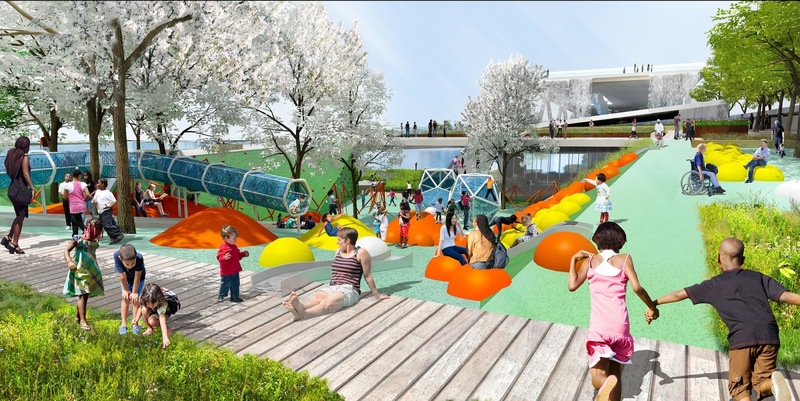 The park at Anacostia Crossing will connect two historically disparate sides of the river with a series of outdoor programmed spaces and active zones that will provide an engaging place hovering above, yet anchored in, the Anacostia River. 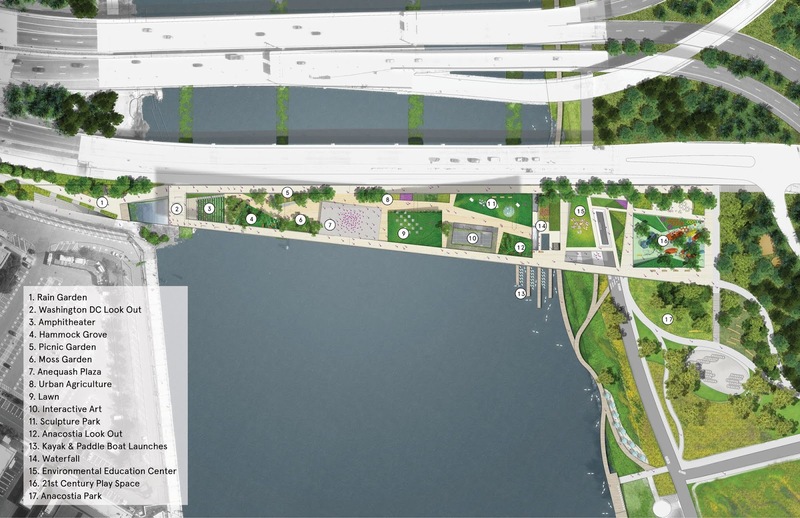 To create this place—more destination than elevated thoroughfare—we have designed the bridge park as a clear moment of intersection where two sides of the river converge and coexist. 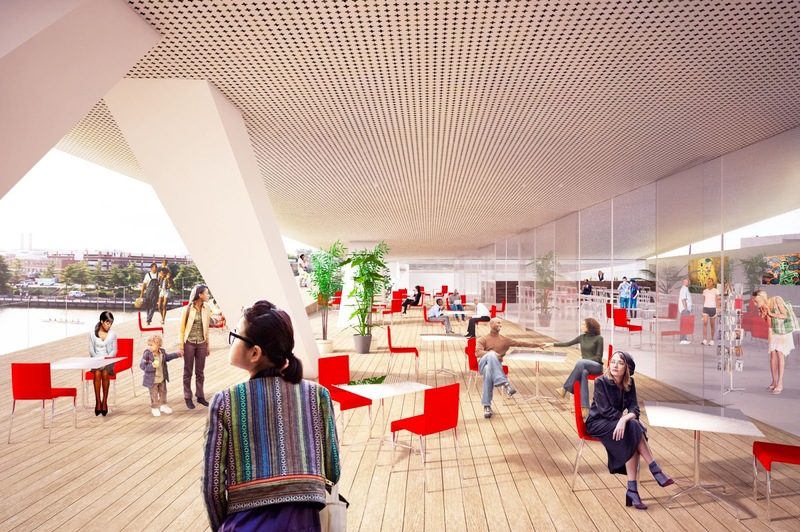 Anacostia Crossing will offer layered programs, presenting a new neighborhood park, an after-hours destination for the nearby workforce, a retreat for residents and a territory for tourists to explore. 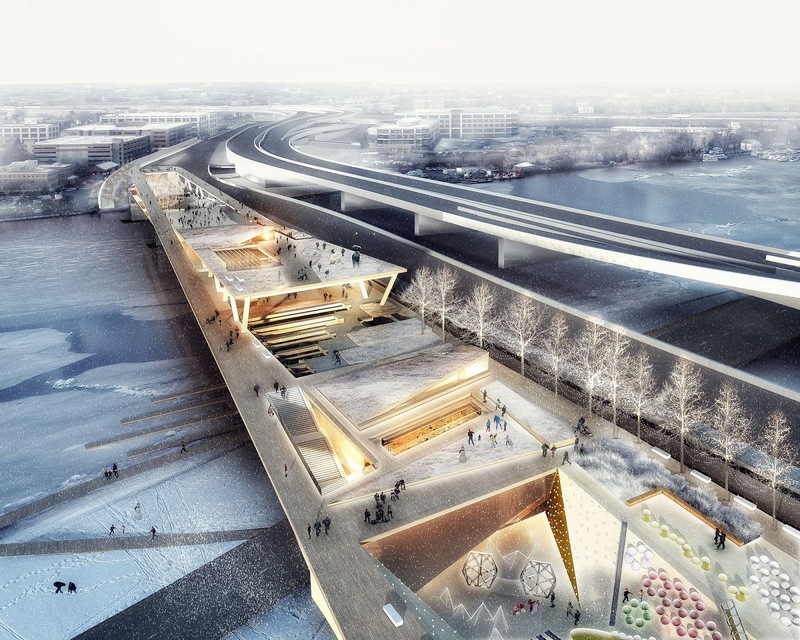 Paths from each side of the river operate as springboards—sloped ramps that elevate visitors to maximized look out points to landmarks in either direction. 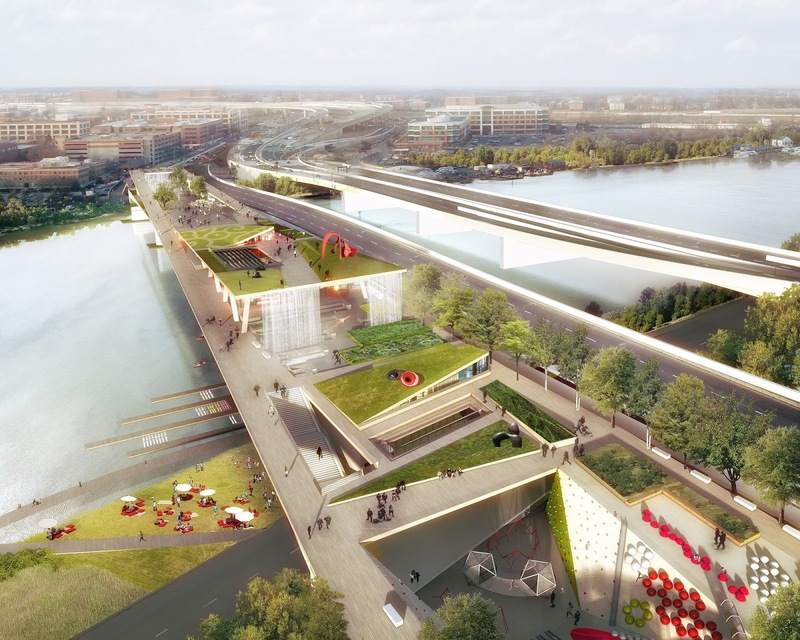 Extending over the river, the Anacostia paths join to form a loop, embracing the path from the Navy Yard side and linking the opposing banks in a single gesture. 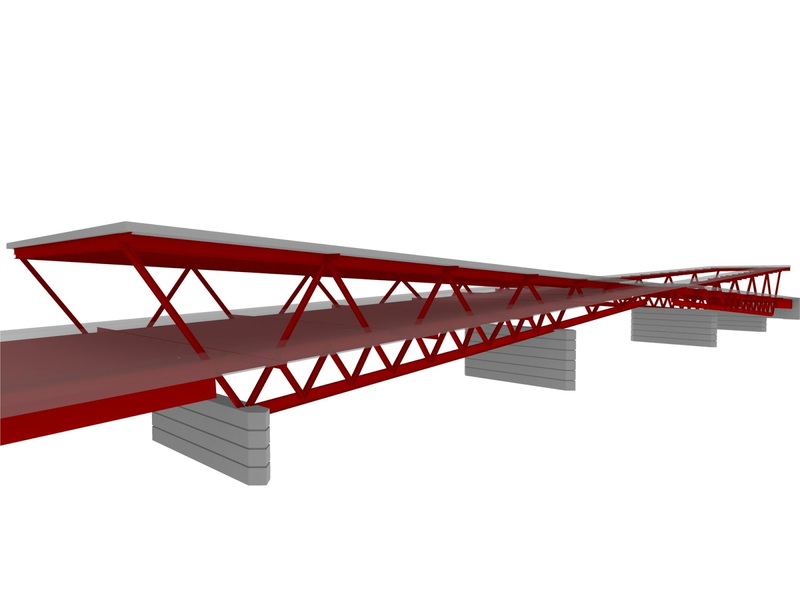 The resulting form of the bridge creates an iconic encounter, an “X” instantly recognizable as a new image for the river. While the bridge is a unique and iconic structure, its character and essence are rooted in making this river landscape accessible to the community. 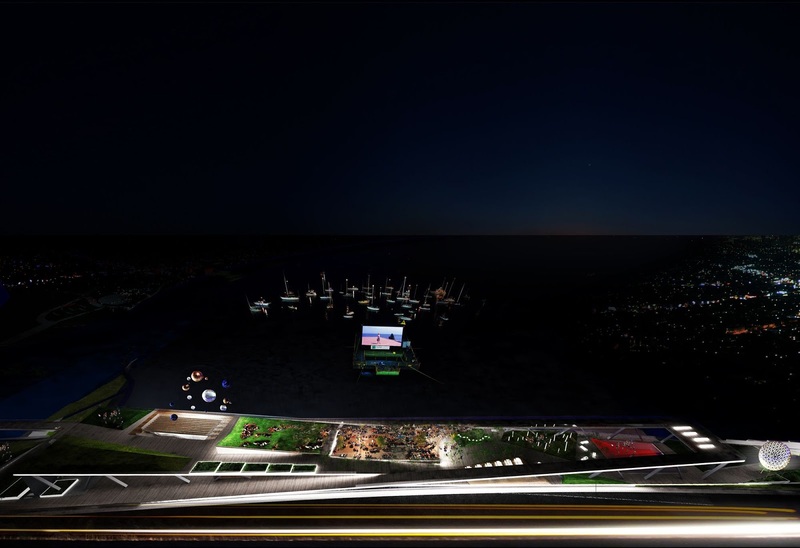 Through programmed activities the bridge will showcase the region’s unique cultural and natural history. To encourage visitors to spend time on the bridge and neighboring communities throughout the year, amenities for comfort and refreshment (restrooms and food), mitigation of climate extremes (shade and warmth), and opportunities for seasonal programming are provided along the entire length of the bridge. The bridge provides a gateway to events with strong roots in the adjacent communities. 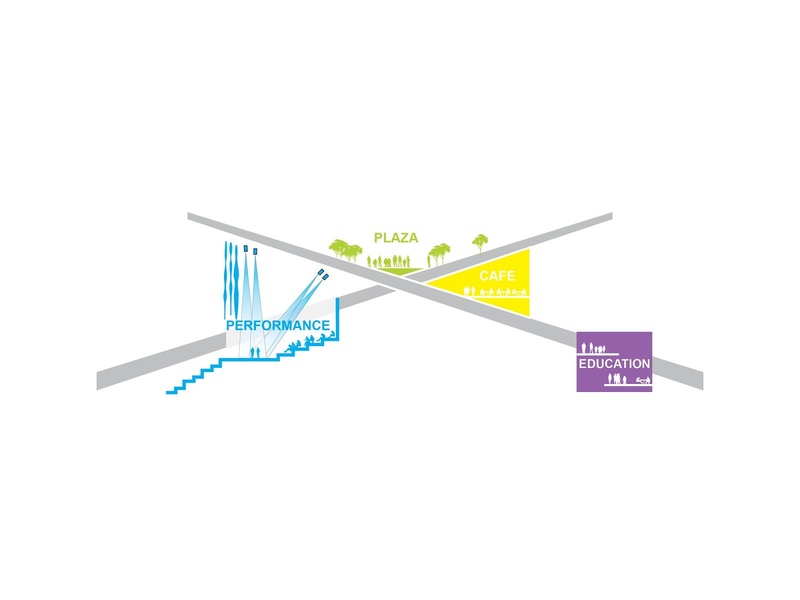 The intersection point of the two paths shapes the central meeting point of the bridge—an open plaza that provides a flexible venue for markets, festivals, and theatrical performances held throughout the year. The paths that frame this plaza further enhance the bridge as a hub of activity, providing a sequence of zones designated for play, relaxation, learning and gathering. The paths also form elevated platforms on a 5% slope with views to the Anacostia River, the activities on the bridge, and prominent landmarks within Washington DC and Anacostia. 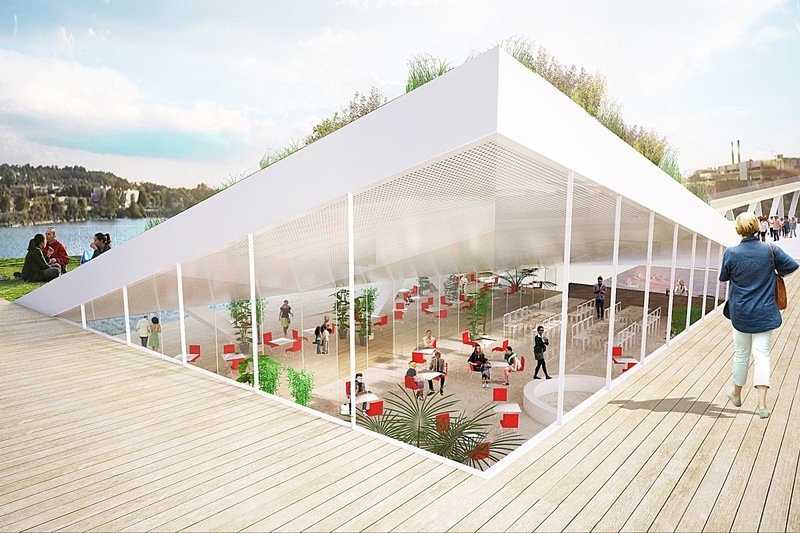 These platforms simultaneously provide shade and shelter for the café on the southeast side and the performance space and hammock grove on the northwest side. At each side, a waterfall marks their terminus and reconnects them to the river below. On the east side, this waterfall is linked to an active filtration system that—together with new wetland areas adjacent to the bridge piers—works to actively clean the river around the Anacostia Crossing. 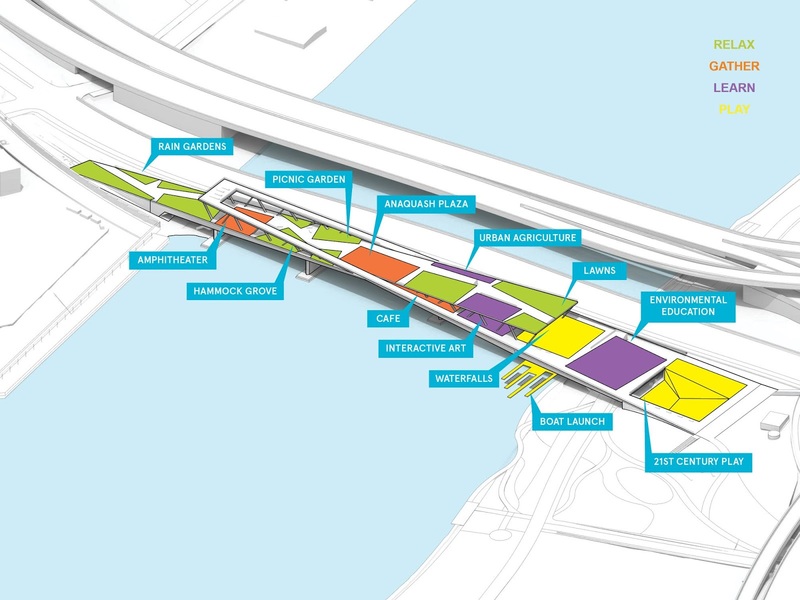 The activated zones and multiple levels of the Anacostia Crossing also bring visitors down to the river itself. 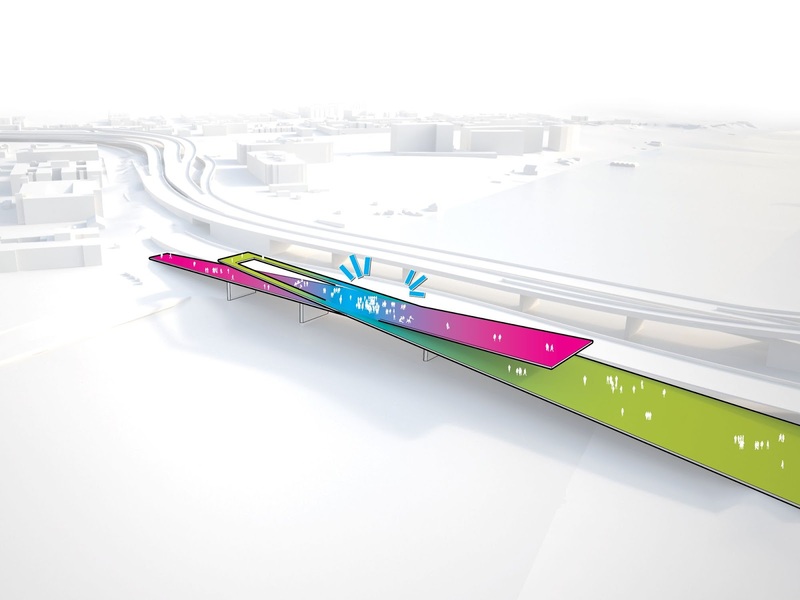 A series of voids along the bridge provide spaces for play and access down to the river itself. 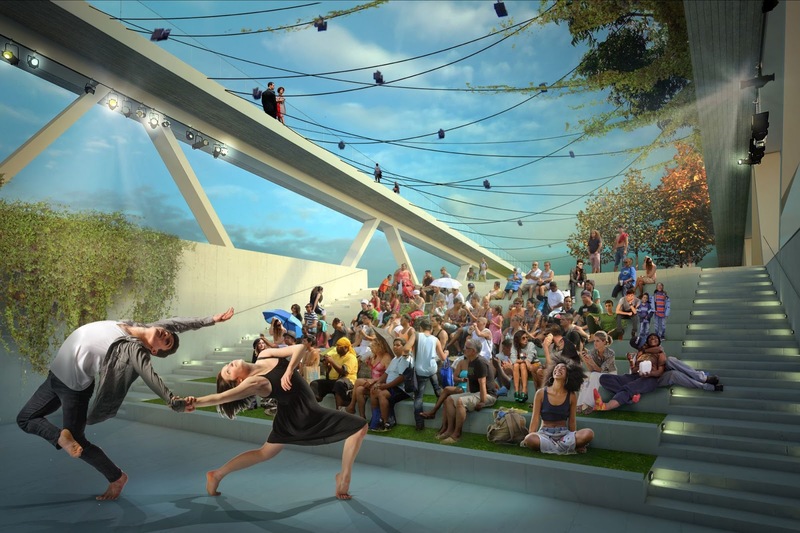 The performance space and café are each partially carved into the body of the bridge, creating intimate zones with views to the waters below. Together, these areas allow visitors to engage the river from multiple vantage points, from above to take in its majesty, or engaging with the waters for boating and recreation. The Environmental Education Center will provide a variety of programs which tell the rivers 400 year history of the River. The Anacostia watershed lost much of its original hardwood forest cover, grassland meadows and tidal wetlands due to the treatment of this landscape by those that lived here as a commodity and not a valued resource. Anacostia Crossing will be a beacon that illuminates the challenged health of the River as well as highlights the possible solutions demonstrated by numerous ongoing efforts to clean the river, build community and educate our next generation of river stewards and engaged citizens. 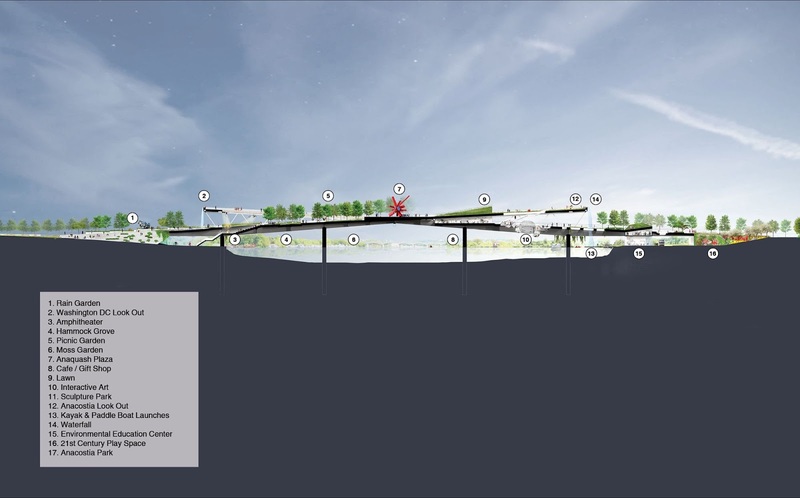 Our design will serve as a catalyst to improve the ecological integrity of the Anacostia River through demonstration and education on ecosystem enhancement as well as restoration shoreline plantings making it once again one of our Nation’s greatest waterways. 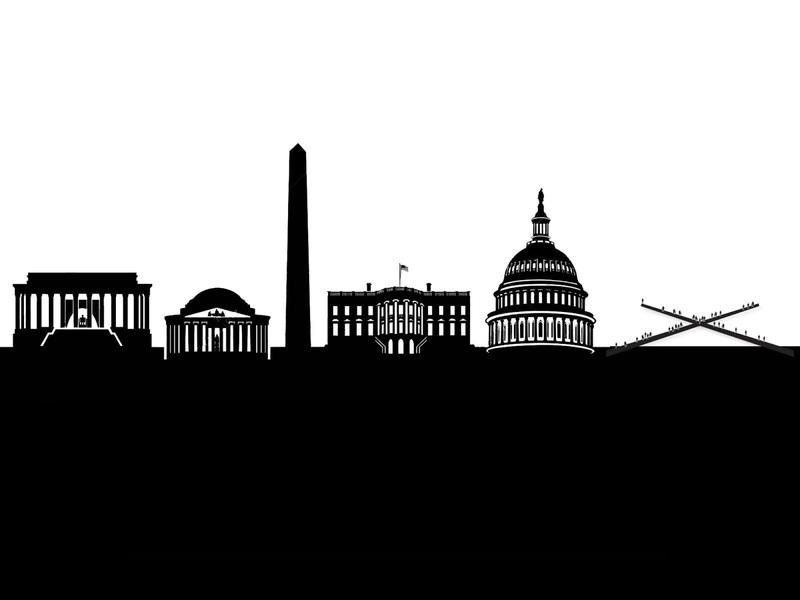 Anacostia Crossing works to promote the health of the citizens of Washington DC particularly those who live in Wards 6, 7 and 8 reflecting the communities’ aspirations for a new quality of life. 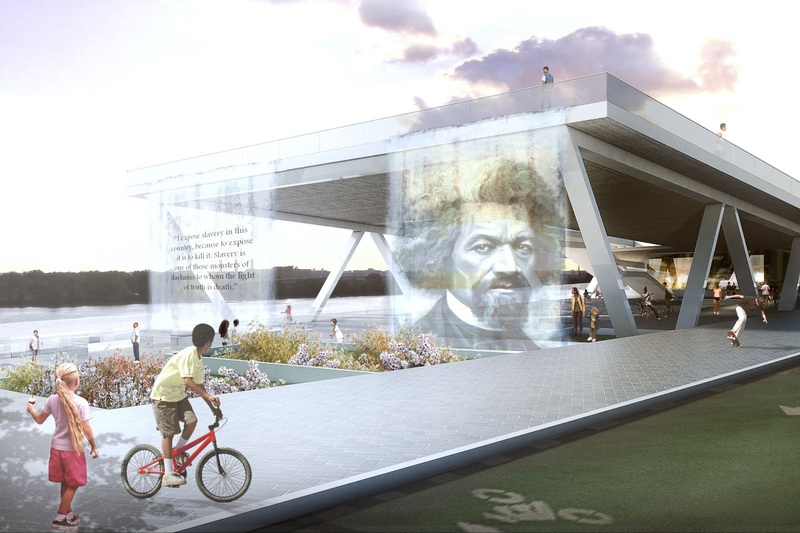 The design builds upon and connects to the existing Anacostia Riverwalk Trails on both sides of the river and creates a new topography for the public to engage and explore. 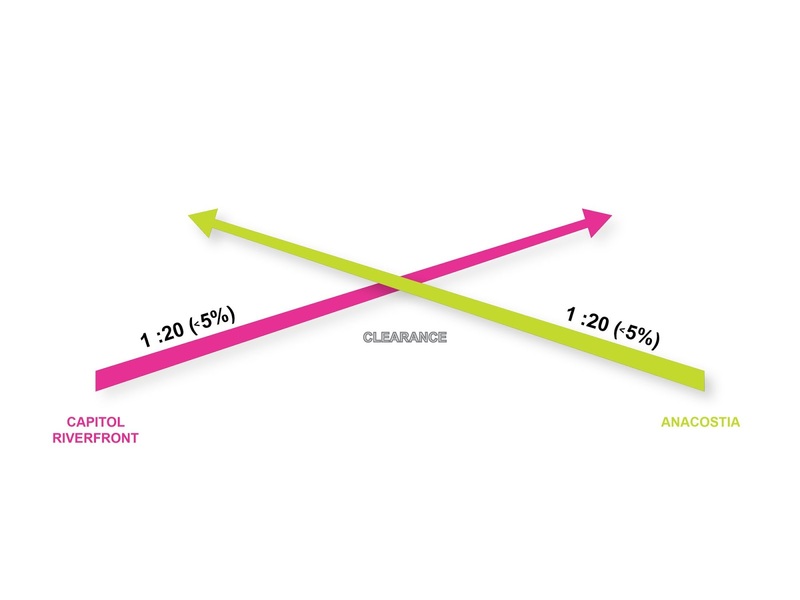 Programmatic elements are also extended in a Phase 2 to provide stepping stones to the heart of Historic Anacostia encouraging residents to explore this new place in the city. Much like the waters of the nearby Chesapeake Bay estuary, where salt and fresh water mix to create a rich biological diversity, the Anacostia Crossing creates a place for sharing the rich cultural diversity of communities on both sides of the river. 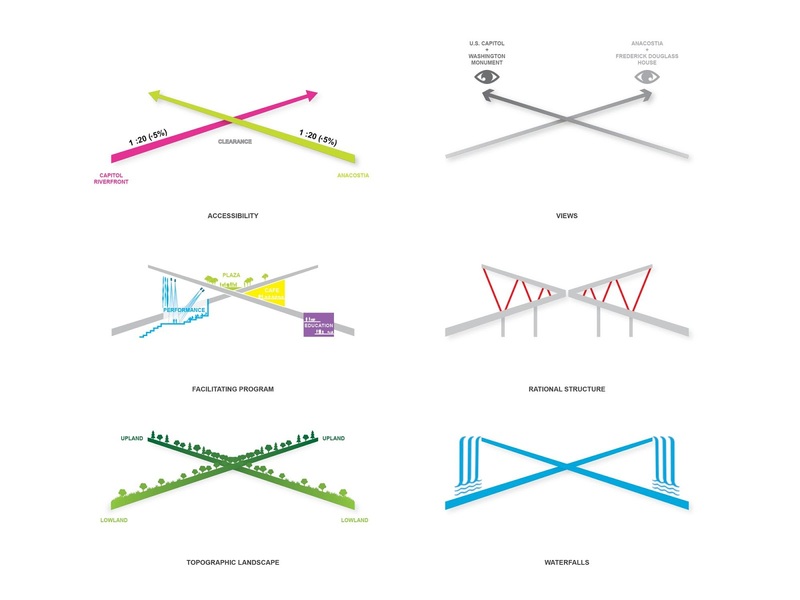 The full integration of architecture, landscape and infrastructure allows for the creation of a socially sustainable civic experience.